#ElCafeDe2013: The Coffee Of Toronto. Toronto has a thriving coffee scene. Independent coffee shops are popping up all over town. During my time there this year I had the chance to explore and consume lot’s of coffee in Canada’s biggest city. Upon entering I immediately noticed Jimmy this and Jimmy that. They have artwork, pictures and more throughout the coffee shop of Jimmy Hendrix, Carrey, Dean, Morrison, Carter, Hoffa and more. Even the coffee beans they sell are named after famous Jimmy’s. They serve locally roasted coffee along with cupcakes, croissants, macaroons and other pastries all coming from local bakeries. My coffee of choice was a basic latte. I enjoyed it amongst bookcases filled with old-school books and encyclopedias. The place had an industrial, homey feel to it. Kensington Market is their second location to the original in Downtown which opened in 2009. I went outside to the patio to get a closer look at the Jimmy mural. I met up with Pola of Jetting Around, another coffee lover, to hit up La Gourmand Café. The upscale bakery sits on the outskirts of the Downtown Core in the Entertainment District on Spadina Avenue. They serve gourmet, in-house made pastries, lunch and brunch and have a good coffee selection. It was the heat of the day when we were there so I went with an iced latte. 🙂 We hung out and chatted for a bit amongst the French cafe décor and atmosphere. Pola and I also randomly found and went into Fahrenheit Coffee on Lombard Street in Corktown and the Downtown Core. We walked into the coffee shop and espresso bar and engaged with the friendly and passionate baristas. They knew their coffee and we started talking about the popular places and brands in the states. We sat on some bar stools at this small coffee shop off the beaten path. They have wi-fi but can’t see it as a place to work all day but to grab a coffee to-go, check e-mail quickly or to hangout with a friend as Pola and I did enjoying our coffees and pastries. I ordered an iced latte from here too. They use locally roasted coffee beans from Te Aro, customized specifically for them. Checkout the time I have also spent at Moonbean Coffee Company and Dark Horse Coffee in Toronto. Follow Pola as she is always Jetting Around, having coffee every step along the way. This year was a great introduction to the Toronto coffee scene. What other coffee shops in Toronto would you recommend checking out? Photo of the Week: Toronto’s Garden Car. 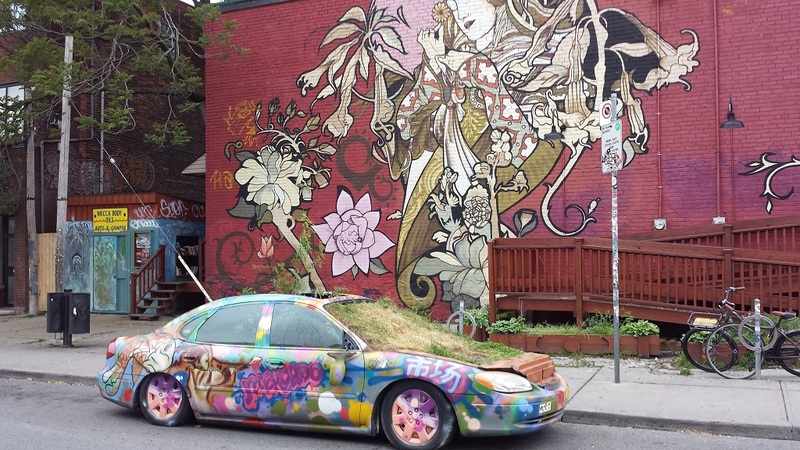 While walking around the Kensington Market neighborhood in Toronto this past summer I came up across a hand painted community car filled with grass and soil, the “Garden Car”. Sitting on Augusta Street near Oxford, this car has been a stable of the market in the warmer months since 2006. An interesting mural as a back drop too. Photo of the Week: A Constantly Evolving Toronto Skyline. Toronto: Stumbling Into “The” Coffee Drink! Prior to my recent trip to Toronto I came up with a plan of attack for diving into the well-known Toronto coffee scene. I asked for tips and recommendations on the social media channels and did a lot of research online. I had a lot of places on my list to checkout. In the early morning hours one day I went over to the Kensington Market neighborhood with the intention of roaming around until the coffee shops on my list started opening. While walking around right in the heart of the neighborhood I stumbled upon another coffee shop that was already open, Moonbean Coffee Company. Walking inside I was immediately drawn to the small-town, cozy, neighborhood like atmosphere. I loved checking out the local flyers and information that was pinned right above the cream/sugar station. I felt like I was a part of the community while reading. Turning around, there were lots of coffee cups above the espresso machine just waiting to be drank out of. On this morning though I felt like getting something different. I asked the barista behind the counter for her recommendation on what to get and she was very friendly and suggested an iced mocha. A few minutes later in a taller glass I got a caffeinated beverage filled with big espresso ice cubes and chocolate syrup was hugging the inside. OMG! I just got “The” coffee drink. Opened since 1995, they are a full-fledged micro roaster of green coffee that people order online from all around Canada. I checked out the coffee beans and roaster as I was consuming the chocolate deliciousness. They also offer plenty of breakfast, lunch and tea options for those that come to hang out in person. They open early and close late seven days a week. Perfect. Immediately upon hanging out and drinking the iced mocha I knew I would come back. There I was the very next morning enjoying the same iced mocha, this time along the front entrance and outside patio. The coffee shop and drink in Toronto that I can’t wait to get back to and experience again, is one that was not even on my radar. When on the lookout for a coffee, or just traveling about in general, keep your eyes open, you never know when you’ll uncover a gem. Toronto: A Million Skyline Looks. During the recent travel blogger conference (TBEX) in Toronto, I attended an after-party on Centre Island, one of the Toronto Islands. On the short ferry ride to get out to the chain islands out in Lake Ontario, it became apparent that I was going to be giving the beautiful and expansive skyline lots of eyeball time. …capturing the skyline which was in the background to the beautiful greenery right in front of me. There the CN Tower sits front and center with the neighboring white-domed Rogers Centre along for the ride. Do you see the plane that’s about to land at nearby Toronto Island Airport? It was getting later in the evening so each shot brought a little more darkness. It’s wasn’t just the tower that was front and center. At times, the sky was lighting up perfectly behind it. …and before you knew it, the city lights were starting to come on in the distance. There she sits, all it up and the CN Tower is standing tall. I loved how the colors reflected off the night waters of Lake Ontario. It was a night of fun and a million skyline looks. Each one seemed better than the next. We docked and I was once again within all the buildings that I spent a lot of the evening capturing. What skyline or other scenes have you just clicked your camera over-and-over again from daylight to night?